Here’s some magic for you. If you add an out of the box style to a view of an App (list or library) the links to the views disappear. We are not talking custom code here. 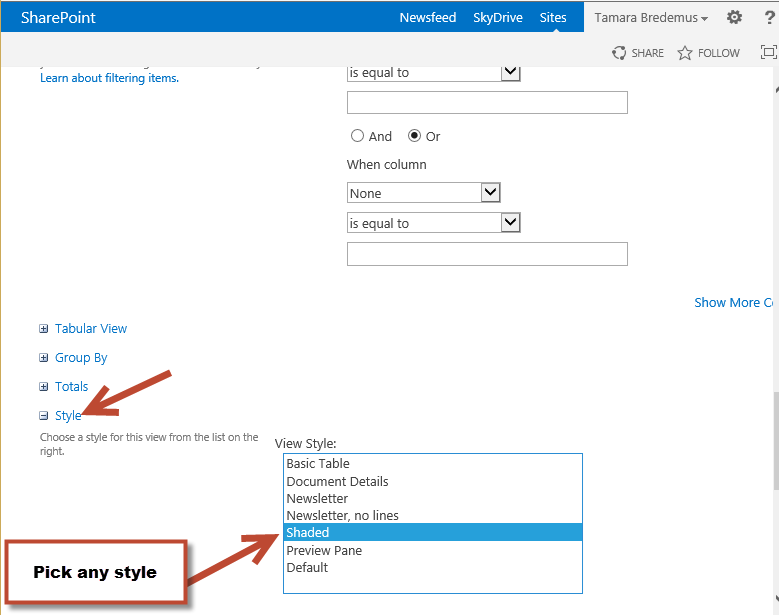 We’re talking about selecting a view style from the Style drop-down. View with no Style added. Links to additional views are missing. Style is applied, but your links to additional views have disappeared. This is NOT the type of behavior I expected. How about you? Please comment if you see different behavior in your uncustomized environment. Watch a video of the demo from SharePoint Saturday and the 2013 Minnesota Government IT Symposium . Create this once on your site and show your users the power and freedom of metadata. Want to learn how to explain metadata to your users without using the old, “Metadata is data about data” definition? Check out What the Heck is Metadata? While defining requirements for any project, you will run into scope creep. You get talked into adding little bits of functionality because “It shouldn’t take anytime.” Then you end up with an additional 900 requirements that “shouldn’t take anytime.” This happens A LOT in SharePoint projects, because SharePoint is so easy (according to some). If you don’t get a grip on this early in the process, you will run into this…. How much do you want to save? Pick a number or percentage. Example: We want to save 30 minutes per transaction. We want to reduce repair costs by 3%. Relevance to project end state – Is this requirement needed to reach the end state? Would this requirement make the end state better? Would this requirement make the end state perfect? Effort – How much time and money with this take? Which resources do we need to complete this requirement? Other Systems – Will meeting this requirement make changes to systems not currently involved in the project? The more systems we touch the more challenging it will be to meet the requirement. Was changing these systems part of the original scope? What steps do you use to manage scope creep? Add them to the comments below. It should come as no surprise to anyone that how we switch views in SharePoint 2013 lists and libraries has changes. To make it easier to spot the differences between 2010 and 2013 let’s do a side by side comparison. In 2013 the Add New Document option is at the top of the library. In 2010 the link is at the bottom. The Library tab is available in both 2013 and 2010. In 2013 click the ellipse. In 2010 click the dropdown in the breadcrumb. Icons in 2013 look cleaner, but basically remained the same. In both 2013 and 2010 adding another web part to the page makes the Ribbon disappear. Users must select the web part they want to work with before the contextual Ribbon re-appears. In 2013 the views remain listed. In 2010 the dropdown in the breadcrumb disappears. Please let me know if I should add something to this side by side comparison for Views.